Phyllis Hunsinger, did not retire from education when she retired as a public school teacher and administrator. Indeed, she doubled-down on her vision of promoting an educational option in Western Colorado which gives secondary students an intensive, hands-on experiences in Free Market Economics. In 2013, Phyllis, along with a group of like-minded friends with backgrounds in education, economics, and non-profits, joined her to form the Freedom and Responsibility Education Enterprise, FREE Foundation, specifically to address the dearth of civics and economics education in area public schools. The FREE Foundation is not a school, but rather a non-profit focused on raising funds to expose students to Free Market Economics through either scholarships to attend existing economic conferences and seminars, or events hosted by the foundation itself. In 2015, FREE awarded scholarships to four students from Grand Junction to attend the Economics for Leaders summer camp in Boulder, Colorado. 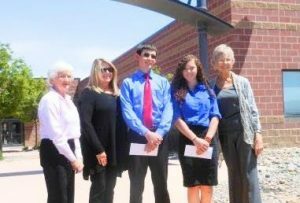 Classroom education is an important function of FREE, and the board of directors, including Phyllis Hunsinger, Ruth Ehlers, Eileen Blanchard, Ron Harrison, and George Rau, serve also as teachers and mentors to students at Grand Junction’s most rigorous charter school, Caprock Academy. Having backgrounds in banking, finance, and education, these board members bring Free Market Economics to about 20 middle school children during weekly classes throughout the fall semester. The classes are not about high-minded theory or crunching numbers, but feature hands-on activities illustrating the beneficial dynamics of free exchange of goods and ideas in a Capitalistic system. Phyllis Hunsinger was a math teacher and served as superintendent of the West End School District in rural Western Colorado. She was dismayed by the lack of economic knowledge among both students and teachers. Of existing–or the lack of existing economics education. After 2 years of building a donor base and relationships with schools, teachers, students and local business leaders in Mesa County, FREE Foundation put on the Western Slope Economic Leadership Conference in November of 2015. Teachers from local school districts selected 100 high school students to attend the conference free of charge. Among the presenters for the conference, which was held on the campus of Colorado Mesa University, were Helen Raleigh, author of “Confucius Never Said,” whose family survived and escaped Chinese Communism, and Betsy Bair, the Western Slope director for Republican U.S. Senator, Cory Gardner.